From the dust of Utopia comes Dark X-Men! Never one to say "die", Norman Osborn is keeping what's left of HIS X-Men alive. MYSTIQUE! DARK BEAST! WEAPON OMEGA! MIMIC! They are the public face of mutants in an Osborn world. And what a face they are! But what does Nate Grey, A.K.A. X-Man, have to do with it? The critically acclaimed team of Paul Cornell (Black Widow, TV's Dr. Who) and Leonard Kirk (Captain Britain and MI13) take on the world of X! 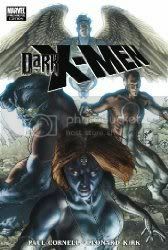 Collects Dark X-Men #1-5. Dark X-Men isn't necessarily a bad story, just not all that engaging. We learn that Norman Osborn may be a little more crazy than he's been letting on. Mystique REALLY wants to be free of his influence. Dark Beast is creepy, no question now, but all in the name of science! And Nate Grey is back, he's pissed, but maybe he is a little overconfident these days. Again, this is one of those volumes that may not seem so important now, but may be laying some necessary groundwork for later.